Carlos Fuentes (b. 1928) was “one of the most admired writers in the Spanish-speaking world,” according to the New York Times. Fuentes was one of Mexico’s most discussed and prolific writers. He visited World Literature Today and the University of Oklahoma as the honored 1983 Puterbaugh Fellow more than three decades ago. 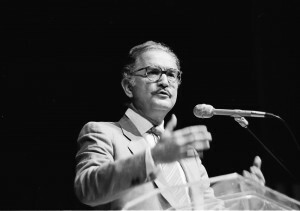 “Any reader of the works of Carlos Fuentes is engrossed almost immediately, and any intelligent reader of the Mexican writer confidently expects to see him become one of the leading interpreters of his nation, not only for Mexicans, but for the world at large.”—Robert G. Mead, Jr. “Carlos Fuentes, Mexico’s Angry Novelist” from the Autumn 1964 issue of WLT (then Books Abroad). Fuentes’ most notable works include The Death of Artemio Cruz (1962), Aura (1962), The Old Gringo (1985) and Christopher Unborn (1987). Also notable is his first novel Where the Air Is Clear (La región más transparente) (1957), and Terra Nostra (1975) which won the Venezuelan Rómulo Gallegos Prize. Literature to Fuentes was both a creative art and a vehicle for furthering social progress, and over a career that produced more than twenty novels, a multitude of short stories, essays, and screenplays, he transformed and enhanced the landscape of literature. Fuentes died in 2012 in Mexico City. Read more about the life of Carlos Fuentes.